I have a confession to make: I’m one of those people who cannot stand shopping because of the crowd. Which is why I do most of my shopping online. It’s fast and convenient, plus I don’t have to deal with the mall crowd. You know those benches in shopping malls outside the stores? I’m always sitting there waiting for rif or Shum while they take their time shopping! One of the places I can’t stand going to is Ikea. I find the experience tiring, confusing and the place is crowded. I will only ever go to Ikea if rif needs to get something from there. 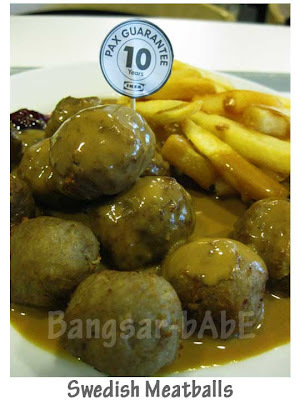 And to pacify me, he would get me a plate of Swedish meatballs (RM8.90 for 10pcs) and a cup of coffee (RM3). The restaurant is always full of people and the queue is super long. 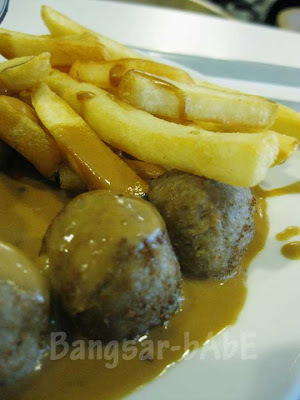 Luckily, he’s the one doing the queuing… o_0 The meatballs come with lingonberry sauce, creamy brown sauce and thick cut fries. These savoury treats are bread-y and meaty, with a hint of nutmeg. The tart lingonberry sauce complements them perfectly. new info, babe…normally girls like shopping….me..can't live without shopping…haha..even though i do online shopping as well!!! what to do, if must eat in IKEA, eat meatballs lor.. 🙁 hehe..
outside nearby got good food wat.. no ? but i always liked walking around in ikea! but ahh…swedish meatballs…i like! I LOVE going to IKEA… dunno why but I used to dream of my perfect home & how I am going to furnish it with Ikea's furniture… lol!!! I love how they can turn a simple idea into such amazing interiors while utilising limited space. This place is also where I used to bring my wife to look around, talking on how to furnish our home… back then we were still normal friends! Anyway, she had made a big sacrifice… she used to eat beef but since she married me, she'd stopped due to my religion belief. LOL gal..isnt Ikea jz as crowded or mayb even more crowded than the mall itself?? Like you, I dislike crowds too. And like you, I like my swedish meatballs. hehe. I read this a twice – from home and my Communicator and can't resist commenting. My favourite meatballs until I had to stop taking coffee. I can down 3-4 cups! BTW the chicken wings had shrunk the last I visit a few days ago. I agree – shopping or browsing thru Ikea is really tiring! 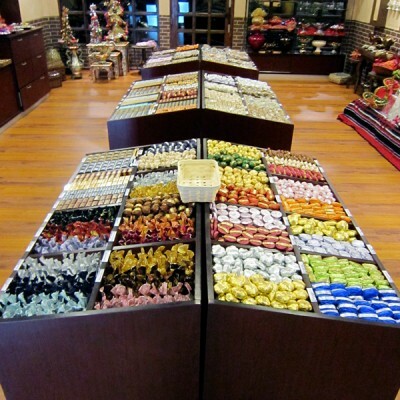 The place is like an endless maze of furniture furniture furniture! Ikea Cafe now is getting more crowded & crowded~~Wonder where does all those ppl come from????? so lucky to have rif to do the errands for you-like the meatballs too! PureGlutton – High 5! I can never find my way properly in there! I spied ppl ordering the chicken wings…but according to rif, jatuh standard de. BSG – KLCC??? Noooooo….that's like my ultimate nightmare, even with meatballs!